I'm a girl with big feet. There, I said it. Knitting socks is immediately gratifying for me, for I can produce a sock with a custom fit and my own favorite features. Diamante features a dense, warm pattern and a substantial heel cup for a cozy feel. The pattern, a cross between a honeycomb and a harlequin diamond, is achieved with neither color changes nor cable needles. A dandy trick ("discovered" accidentally during a frenzied midnight knit) at the end of the heel turn will eliminate the need to pick up extra stitches or fill in holes at the juncture between the heel flap and the leg. I promise. These socks are worked toe-up on two circular needles. If you are unfamiliar with this technique, instructions may be found here. If you prefer, the socks may be worked using the "Magic Loop" technique, or on double-point needles. 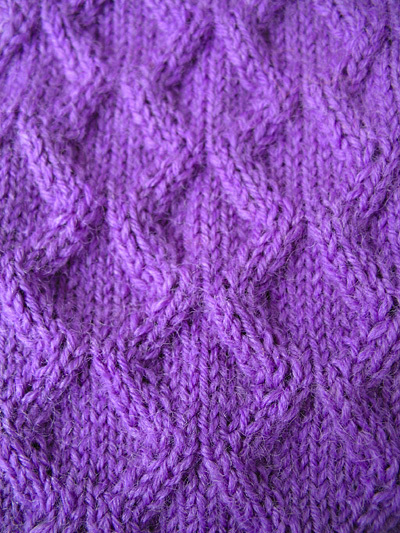 If you choose to use double-point needles, divide the stitches between the needles in multiples of 12. An excellent visual demonstration of the Figure Eight Cast On method can be found here. If you have a preferred toe-up start method, feel free to use it. Judy Becker's Magic Cast-on is a particularly interesting means of starting your toe, and there are many others. Use the method with which you are most comfortable, yielding twelve stitches on each of two circular needles. Throughout the pattern, when instructed to "m1" (make one stitch), do so invisibly by inserting your left needle, from front to back, under the horizontal strand which lies between the stitches of the previous row, then knitting it through the back loop. Using the Figure Eight Cast On method, CO 12 stitches onto each of 2 circular needles (24 sts). K 1 round, working into the back loop of each st. Note: Throughout this pattern, the first needle of the round will be referred to as Needle 1; the second needle will be Needle 2. Toe Increase Round: [K2, m1, k to last 2 sts on needle, m1, k2] twice. 4 sts increased. Repeat this round five times more. 48 sts. Repeat these two rounds five times more. 72 sts. Set-up Round: Work Round 1 of chart patt to end of Needle 1; k to end of Needle 2. Cont in patt as set, working sts of Needle 1 in chart patt and sts of Needle 2 in stockinette st, until work measures approx. 3.5 inches less than desired length, ending with Round 5 or Round 11 of patt. Gusset Increase Round: Work in patt to end of Needle 1; k1, m1, work to last st of Needle 2, m1, k1. Work 1 round in patt as set. Repeat these 2 rounds ten times more, then work Gusset Increase Round once more. 96 sts; 36 sts on Needle 1, 60 sts on Needle 2. You should have just worked Round 4 or Round 10 of chart patt. Heel is worked back and forth over the sts on Needle 2. Row 1 [RS]: Work in patt to end of Needle 1 (Round 5 or Round 11 of patt); k first 40 sts of Needle 2. Turn work. Even-numbered Row 2-16 [WS]: Sl 1, p19. Turn work. Odd-numbered Rows 3-15 [RS]: Sl 1, k19. Turn work. Row 17 [RS]: Sl 1, k17, w&t. Row 18 [WS]: Sl 1, p15, w&t. Row 19 [RS]: Sl 1, k13, w&t. Row 20 [WS]: Sl 1, p11, w&t. Row 21 [RS]: Sl 1, k9, w&t. Row 22 [WS]: Sl 1, p7, w&t. Row 23 [RS]: Sl 1, k5, w&t. Row 24 [WS]: Sl 1, p3, w&t. 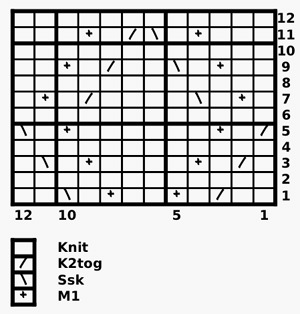 Row 25 [RS]: Sl 1, k11, pick up and k 8 sts (1 st in each slipped st) along edge of flap. Turn work. Row 26 [WS]: Sl 1, p27, pick up and p 8 sts (1 st in each slipped st) along edge of flap. Turn work. You will now have 76 sts on Needle 2: 36 heel flap sts, and 20 gusset sts on each side of the flap sts. Row 27 [RS]: [Sl1, k1] 17 times, sl 1, ssk. Turn work. Row 28 [WS]: Sl 1, p34, p2tog. Turn work. Repeat Rows 27 and 28 eighteen times more. 38 sts on Needle 2. Work Row 27 once more, but do not turn work. Proceed to Leg. Next Round: K all sts of Needle 1; k2tog, k to end of Needle 2. 72 sts. This will count as Round 6 or Round 12 of chart patt. Next Round: Work all sts of both needles in chart patt. Cont in patt as set until leg measures 1.5 inches less than desired length. Next Round: [K1, p1] to end. Repeat this round until work measures desired length. BO all sts loosely in rib. 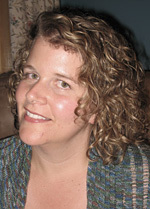 Deb Barnhill lives in Nova Scotia with 2 spirited toddlers and a husband who has given up trying to understand her yarn fixation. She blogs her brains out here.